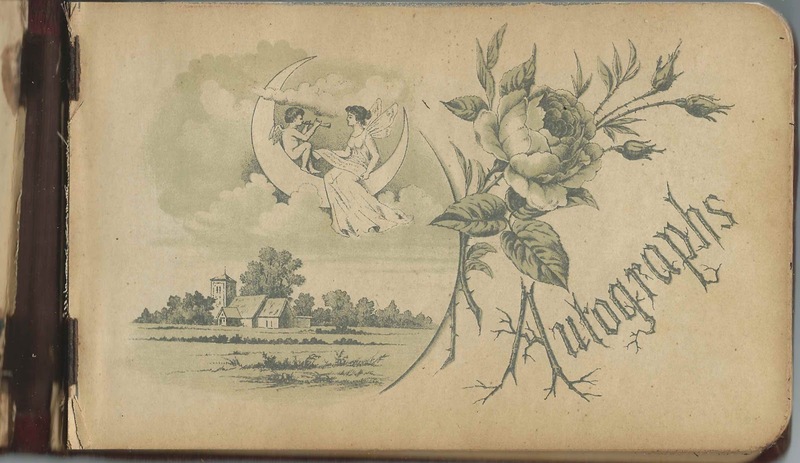 1889-1910 autograph album that belonged to a Nellie, presumably a student at Hebron Academy at Hebron, Maine, in the mid-1890s, as were a number of the inscribers. 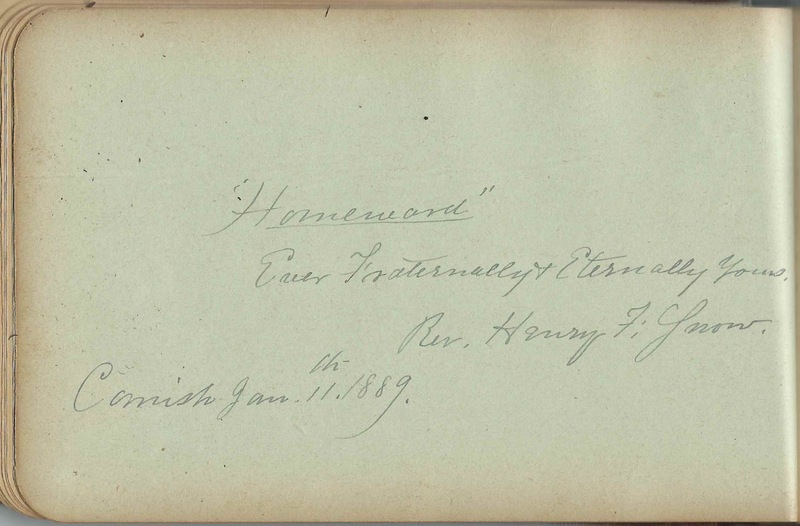 Hebron Academy is still in operation today. 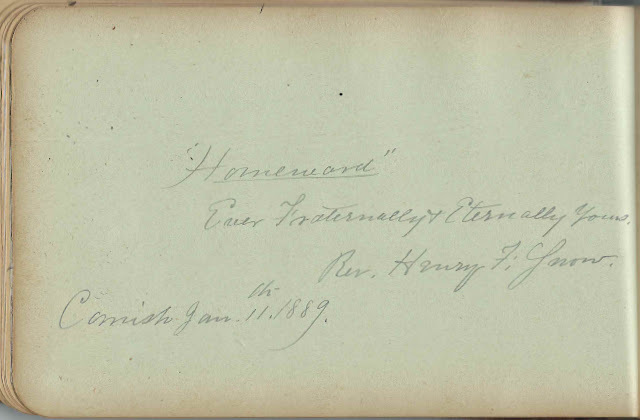 In pursuing the album's owner identity, I'm grateful for the help of the Hebron Academy archivist, who concurs that the likely owner was Nellie E. Marr, who gave her residence as Cornish, Maine, and her guardian as A. H. Marr, when she signed in to the Class of 1893. Because a few of the inscriptions are from Cornish, Maine, and from other clues, it's likely that the album was owned by Ella E. Marr, "Nellie", daughter of Aaron Hagan Marr and Anna H. (Trafton) Marr. The first inscription in the album was that of Edmund Trafton of West Buxton, Maine, who was a cousin to Ella E. Marr, "Nellie". Nellie's mother and Edmund's father were siblings, I believe. Rev. 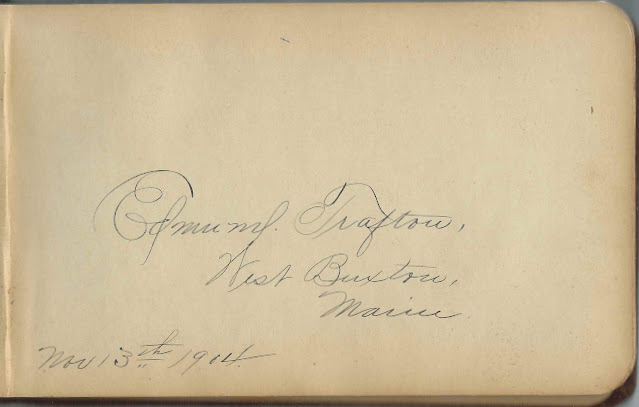 Henry Francis Snow, who had served in the 27th Maine in the Civil War, and his wife M. Augusta (Cox) Snow inscribed pages at Cornish, Maine, in January 1889. 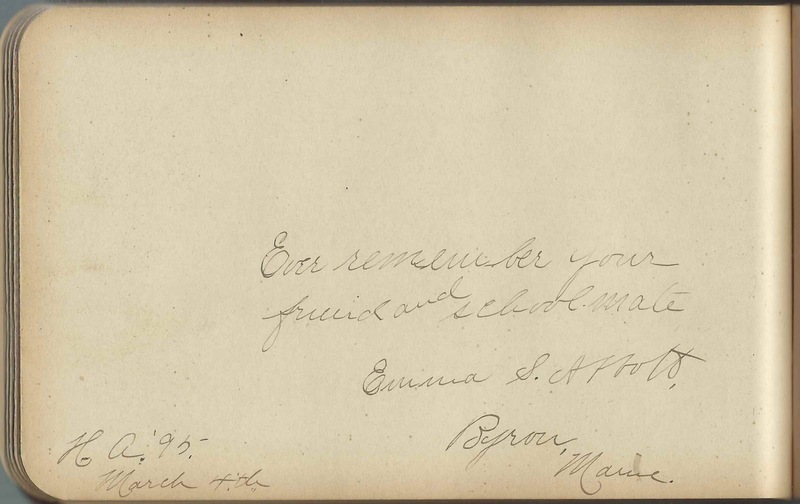 Two of the inscribers were M. Leda Abbott and Emma S. Abbott of Byron, Maine, who indicated they were in the Hebron Academy Classes of 1893 and 1895 respectfully. Emma indicated that Nellie was a schoolmate. 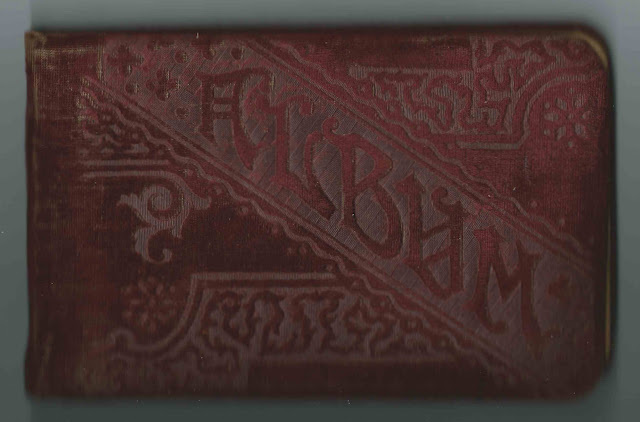 Perhaps a reader has access to a Hebron Academy catalog from that era to see if there's mention of a Nellie E. Marr, or other Nellie. The album measures approximately 7-3/4" by 5" and contains the sentiments of 24 of Nellie's friends, schoolmates and at least one teacher. An alphabetical surname list and an alphabetical list of the inscribers, together with any personal information they offered, appear at the end of this post. 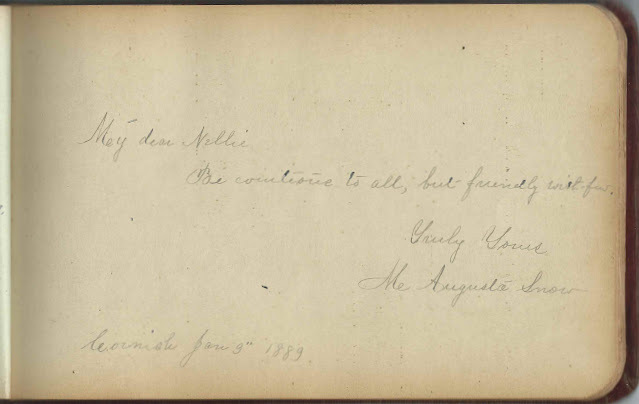 If you have information on Ella E. Marr, "Nellie", or have a different take on the identity of album owner Nellie, based on the information above and any clues that might be contained in the list of inscribers below, please leave a comment or contact me directly. 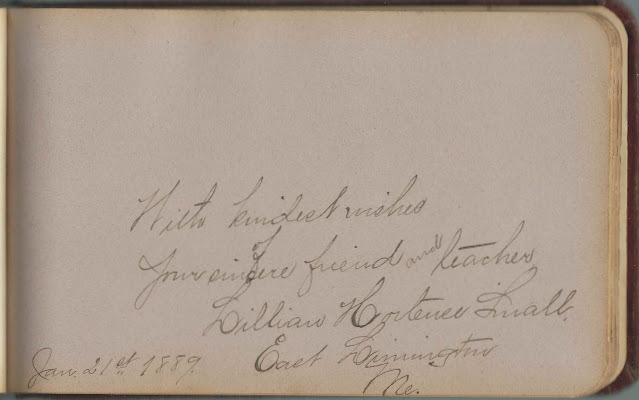 Another page was inscribed on January 21, 1889 by Lillian Hortense Small of Limington, Maine, who noted that she was Nellie's teacher, before Nellie's enrollment at Hebron Academy. Lillian was born August 10, 1859, the daughter of George Melville Small and Mary Adams (Small) Small of Limington.